Maurice Baring, the fifth son of Edward Charles Baring (1828–1897), was born at 37 Church Street, Mayfair, on 27th April 1874. His father, who was a banker, was created the first Baron Revelstoke in 1885. Baring was educated at Eton College and Trinity College. However, he left Cambridge University without taking a degree. A talented linguist he joined the diplomatic service in 1898 and served as attaché in Paris, Copenhagen, and Rome. After spending a year at the Foreign Office in London he resigned from the service in 1904. Baring now joined The Morning Post where he reported on the Russo-Japanese War. His experiences appeared in the book With the Russians in Manchuria (1905). After working in St. Petersburg and Constantinople he moved in 1912 to The Times where he became their special correspondent in the Balkans. According to his biographer, Robert Speaight: "During these years he learned Russian and developed an abiding sympathy for the Russian people which political changes could not disturb." On the outbreak of the First World War, Baring joined the Royal Flying Corps. In August 1915 he was appointed as "mentor and guide" to Hugh Trenchard. In 1918 Baring became a staff officer of the Royal Air Force. Several of Baring's closest friends were killed during the war. This included Julian Grenfell, Raymond Asquith and Patrick Houston Shaw-Stewart. The death in action of these men inspired him to some moving verse, which he published in 1919. According to William Orpen, Baring's poem, In Memoriam "is the greatest work of art that's come out of this whole war." 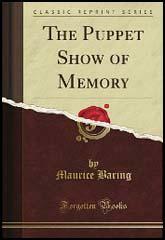 Baring later wrote about his war experiences in his autobiography, The Puppet Show of Memory (1922). Baring was a close friend of G. K. Chesterton began, and it has been suggested that Baring was the model for Horne Fisher, the connecting character of the stories that compose The Man Who Knew Too Much (1922). After the war Baring wrote a series of successful novels including Passing By (1921), C (1924), Cat's Cradle (1925), Daphne Adeane (1926), Robert Peckham (1930), In My End is My Beginning (1931) and The Lonely Lady of Dulwich (1934). 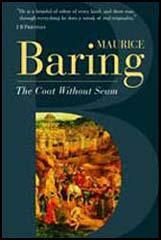 One critic, P. M. Irvine, has argued that Maurice Baring's novels have come to be regarded as: "minor masterpieces in character study and social depiction. Limited as they are in subject and theme … they can be appreciated for the accuracy with which they reproduce the world of the late Victorian élite, for the purity and simplicity of their style, and for the sensitivity and erudition which they display." In the early 1930s Baring began to suffer from paralysis agitans. He continued to write and Have you Anything to Declare?, an anthology of favourite quotations in several languages, was published in 1936..By 1940 he was forced to leave his Rottingdean home and was looked after by friends in Scotland. Maurice Baring died unmarried, at Beaufort Castle, near Inverness, on 14th December 1945.